Här kommer fortsättningen på min serie om the Lieberman-Warner Climate Security Act – S. 2191. Och hur USA och olika delstater kommer att drabbas. The Senate’s leading climate-change bill, while aiming to combat global warming by reducing carbon dioxide in the air, actually poses ”extraordinary perils” for Americans and the economy, according to a new study from The Heritage Foundation. The study, produced by Heritage’s Center for Data Analysis (CDA), forecasts severe consequences-including crushing energy costs, millions of jobs lost and falling household income-if Congress enacts the so-called Lieberman-Warner bill. The Lieberman-Warner legislation promises extraordinary perils for the American economy, should it become law, all for very little change in global temperature…perhaps even smaller than the .07 of a degree Celsius drop in temperature that many scientists expected from worldwide compliance with the Kyoto climate change accords. S. 2191 imposes strict upper limits on the emission of six greenhouse gases (GHG) with the primary emphasis on carbon dioxide (CO2). The mechanism for capping these emissions requires emitters to acquire federally created permits (called allowances) for each ton emitted. Arbitrary restrictions predicated on multiple untested and undeveloped technologies will lead to severe restrictions on energy use and large increases in energy costs. In addition to the direct impact on consumers’ budgets, these higher energy costs will spread through the economy, injecting unnecessary inefficiencies at virtually every stage of production and consumption. Consumers will be hard hit. 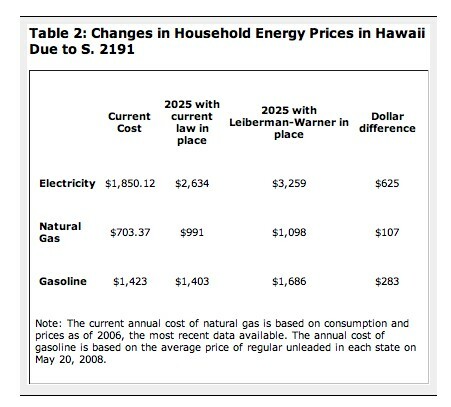 Table 2 shows the expected increases in retail energy prices (adjusted to 2006 dollars to eliminate the impact of inflation) in 2025 for Hawaii. Between 2012, when the restrictions first apply, and 2025, the prices of electricity, natural gas, and gasoline could rise by nearly 20 percent nationally when compared to prices in a world without S. 2191. In addition to taking a bite out of consumers’ pocketbooks, the high energy prices throw a monkey wrench into the production side of the economy. 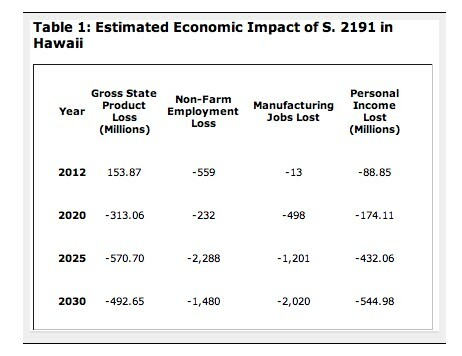 Contrary to the claims of an economic boost from ”green” investment and ”green-collar” job creation, S. 2191 reduces economic growth, gross domestic product (GDP), and employment. To learn more about the economic effects of the Lieberman-Warner legislation, see ”The Economic Costs of the Lieberman-Warner Climate Change Legislation”, CDA Report published on May 12, 2008. This Report is available at http://www.heritage.org The authors gratefully acknowledge the work of Dr. Shanea Watkins in preparing the maps used in this briefing memo. © 2008 Hawaii Reporter, Inc. This entry was posted on 1 juni, 2008 at 1:10 f m and is filed under Miljö - Environment, USA. You can follow any responses to this entry through the RSS 2.0 feed. You can leave a response, or trackback from your own site.